Over the last decade, I feel like I “became” part of the community. I invested in her, and she has a way of paying it forward. The people you meet, the events you attend, the sessions you teach …. they all have a way of coming back to reward you. To anyone reading this questioning whether or not they should go to that VMUG, or VMworld, or various other events, the answer is unequivocally YES! Make new friends, introduce yourself, invest in her and she will return it to you again and again throughout your career, even where some employers will not. Many of my friends and colleagues in the industry will back me up on this one. 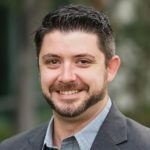 A few years ago, the community led me to NetApp after a decade of various consulting, admin, and engineer roles. That was a great experience, I met tons of new people, and affected change within a large Fortune 500 organization in multiple ways. I can attest that there isn’t much that is more rewarding. Today begins another new chapter that my involvement in the community has played a large part in. First, I wanted to extend a thank you to all of the companies that pursued me during the last couple of months, and especially to those that hosted me for talks. For whatever reason, one of our situations were either too hot or too cold, and I needed to continue to find the one that was juuuuust right. When I met with the team at Cohesity, I knew in a few short hours that I had found my Goldilocks. My role will span lots of duties from those of tech marketing & internal engineering, to sales engineer to PR/AR, but all under the umbrella of Tech Evangelist. In a small startup, I’ll be useful wherever I can be useful. This is new territory for me, but the sheer focus on “execution” is really what has me the most excited, especially with the current team at Cohesity. Thanks to Mohit, Tiffany, Mike, and the rest of the team at Cohesity for trusting me with such a pivotal role in your company, and I couldn’t be more excited to get started!